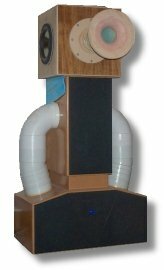 Subwoofer ports have to flow a lot more air than their conventional speaker counterparts. Since increasing the area of a port quickly produces very long ports, the most effective means of moving more air is to increase the air velocity. Ports operating below about 10 m/sec generally have no problems with turbulence and compression. As velocity is increased beyond this, turbulence occurs as air exiting the port is forced to slow too quickly as it encounters the surrounding still air. Flared ports cause the airflow to expand and loose speed in a controlled fashion, allowing higher speeds without turbulence. This method targets the air in the "boundary layer", which is close to the walls of the port. Increasing velocity even further, the air in the "core" of the port becomes turbulent. Flares are unable to help with this problem, which represents the limiting velocity for the port. By this stage the port is beginning to present a different load to the system, resulting in de-tuning and subsequent loss of output, known as compression. ROUND ONE, concentrated on a range of 86mm ports operating at 30hz only, and measured how usable velocity increases with flare size. ROUND TWO, duplicated these findings for 103mm ports, and more importantly, measured the limiting velocity for both diameters. In addition, changes in performance at different frequencies were investigated. 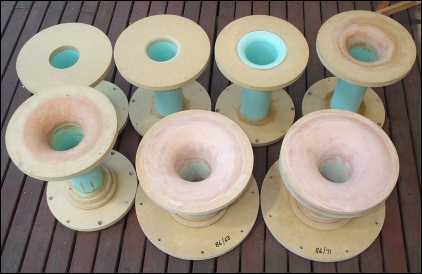 Several measurements were also taken for 152mm ports. ROUND THREE, examined whether the inside flare could be smaller than the outside flare, without affecting performance. Area Ratio is defined as the cross-sectional area (CSA) of the port opening, divided by the CSA of the unflared section of the port. It gives an indication of how quickly the air has to change velocity as it exits a flared port, and is a more useful measure than flare radius alone. It allows comparisons to be made for ports of different diameters, and is the measure used to describe the ports used in these tests. Chuffing is defined as "any audible noise, other than the intended signal, detected by listening with the ear close to the port"
I'm confident that anyone who repeated the tests would find their results very close to those presented here. Even if a different threshold for chuffing was chosen, the relationships found in these tests would still be present. The main area of subjectivity is in deciding how to translate results based on barely audible chuffing, into recommendations for typical music and home theater applications. A test was done to see how much the port velocity could be increased before the "chuffing" became audible at the seating position. For a seat 2.5 metres from the sub in a room 5m * 4m, the velocity could be increased by 25%. An allowance for the masking effect of content can also be used. The actual amount is based on the performance of sub's I've built, and on existing industry recommendations. 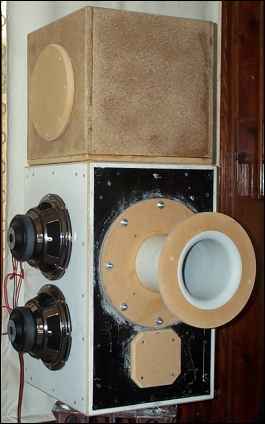 I estimate that reasonable values for masking allowance are an additional 15% for music and 30% for Home Theatre usage. A sine wave was applied to each port / flare combination, and the signal level slowly increased. Care was taken not to use high power for longer than several seconds, particularly for the 30hz tests (at the tuning frequency excursion is at a minimum = less cooling) When "chuffing" was first detected, the voltage across the drivers was recorded. Voltage measurement should thus give an accurate means of determining input power, and in conjunction with modelling in WinISD, determining SPL and port velocity. This neatly bypasses any problems with room nodes that can occur if an SPL meter is used. The approach was discussed with members of the diyAudio discussion forum, and with the WinISD support forum. A test was done comparing SPL determined by voltage measurement, against SPL measured with an SPL meter. An existing sub was measured at 30hz, outside, on the edge of a deck, with the acoustic centre 1.25m above ground, and the SPL meter 1m away. Simultaneous measurements of SPL and voltage were taken. The voltage across the drivers was 11.5V RMS, measured with an analog multimeter. To accurately specify the input power at 30hz, the modelling in WinISD is done without any amplifier boost factored in. This SPL figure given by WinISD is for measurement in "half-space". To convert a "half-space" SPL to an equivalent "full-space" value, subtract 6dB. Fifteen ports were tested for a range of frequencies. (15, 20, 25, 30 and 35hz, power and excursion permitting ) The ports ranged in diameter from 51mm to 152mm, and the flares ranged from 10mm to 75mm. Several boxes were required to optimise velocity and port length for the different port diameters. Round one utilised 50 litre box with two 10 inch drivers. Round two used a four-driver box that could be configured for 70, 100 or 160 litres. 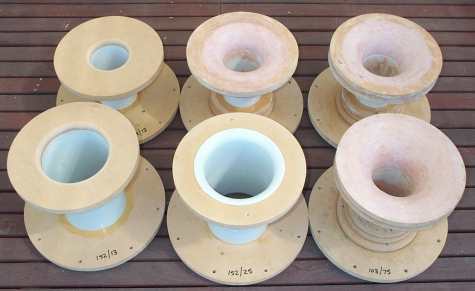 The ports are made from PVC pipe, with a 270mm flange at each end. One or more smaller supporting rings are utilised, depending on the construction of the actual flare. 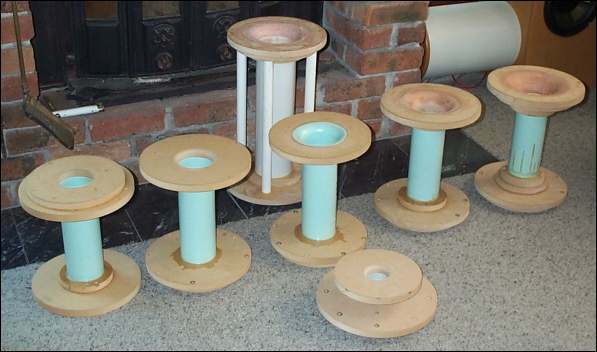 The MDF pieces were glued together with PVA glue, and the PVC pipe was glued into the MDF with epoxy resin. The mounting end of the flare has a bolt pattern the same as a 10 inch driver, and is stepped so that the flare lines up with the inside face of the box. The ports have a stepped mounting flange so that they line up flush with the inside face of the box, as shown in this picture. For round two of the testing, another eight ports were built. The solution was to use several different sized boxes. 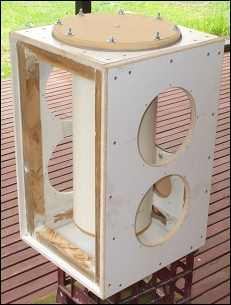 Round one tests used a 50litre box and had a pair of 10inch drivers driven by the Jaycar 350w amplifier. Into the 7ohm load presented by the two drivers in series, it delivers up to 240w. The test port is mounted externally and is forward firing, whilst the drivers are located on each side. 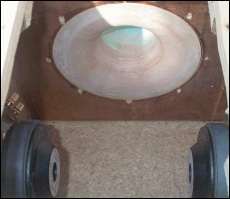 Foam gaskets were used under the drivers and the port. The port was mounted with eight roofing screws, which, along with a cordless drill, made changeover time much easier. As stated above, an additional 40% of input power can be utilised for listening to music. This 40% allowance isn't applied once the limiting velocity is reached, because core turbulence begins to cause compression and de-tuning. A graphical approach was used to add this allowance, and then find equations describing operation at, and below the limiting velocity. It was found that departing from the 30hz test frequency changed the usable velocity. At 35hz, the limiting velocity is higher than the 30hz figure by +23%. The third round of tests examined whether the inside flare could be smaller than the outside flare, without affecting performance.